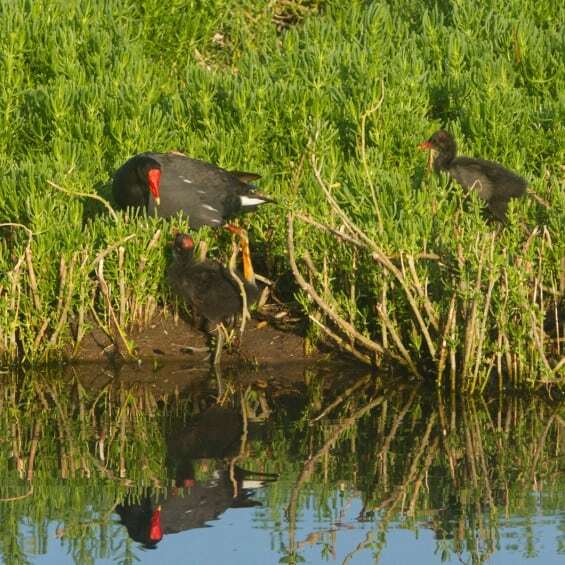 An adult gallinule with two chicks. This 13-inch tall slate-gray bird has black feathers on its neck and head with white feathers on its flanks and under its tail. It has a bright red frontal shield and bill with a yellow tip. Its legs and rather large unwebbed feet are yellowish-green. The ‘Alae ‘Ula is very secretive, usually remaining close to dense vegetation and hiding quickly when it senses danger. Gallinules feed on aquatic insects, mollusks, algae, water plants and grasses. They build nests of reeds and other aquatic vegetation and lay clutches of between 6 and 13 eggs. Young chicks are able to run and swim within a few hours of hatching. They are covered with black down and have a bright red bill. The ‘Alae ‘Ula is an endemic water bird (found naturally only in Hawaii) that is an endangered species with a total population perhaps in the hundreds. According to Hawaiian legend, the gallinule brought fire from the volcano home of the gods to the Hawaiian people. During his flight, the gallinule’s formerly white forehead was burned red by the volcanos’ fire. You are likely to see gallinules at the Ka’elepulu Wetland by standing quietly for several minutes and watching for them to come out of the vegetation near the water’s edge. Listen for their chicken-like cackling calls and croaks which are louder and higher pitched than the coot’s.